She was six the first time she did it. She was the first black child to walk into an all-white elementary school in New Orleans. It was November 1960, three years after the Little Rock Nine desegregated Central High School in Arkansas, three years before Tulane University would accept its first black students. In this simple, unwitting act  Ruby thought it was Mardi Gras: the barricades, all those policemen, the screaming people with their arms waving around  she became, literally, America's poster child for . . . for what? "The Problem We All Live With"
Ruby never cried in front of the crowd outside, though sometimes she stopped and prayed in their direction. The enormity of it all didn't really settle in for some time, for many years in fact. Because, by the fall of 1961  a new school year  the crowds had dispersed, a mix of black and white kids enrolled at William Frantz and Ruby Bridges was just another student in another desk. Life went on. Eerily so, in fact. "She looked exactly like everybody else outside, but she showed me her heart and there was absolutely no way I could think she was the same as them. So the lesson I learned was that you can't look at a person and judge them  and I think that shaped me into who I am. "So, for me, it's important to try to explain that to kids, the way I learned it. It's amazing how drawn to my story they are. And I think that's because they put themselves in the shoes of that little six-year-old person. And they think: If she could do that, I can do it. And every day, I do see the hope on kids' faces, and I see it across the board  Asian, Hispanic, black, white. And I really feel in my heart of hearts, that there is hope for us and that this world will be a better place. If not for you and I, for our kids." 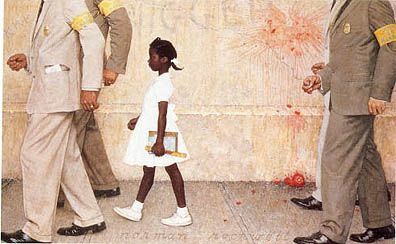 "Let's face it: For a very long time, people knew that Rockwell painting, but they didn't know who that person was, or the real story behind it," she said. "Up until the books came out, nobody knew me or what I was doing. Rosa Parks, Dr. King, a couple other people  you've always heard about them. But you don't ever see me there with them. Maybe it's going to take a little more work. After the inauguration, Ruby Bridges' husband and son will fly home to New Orleans. She will continue on to Boston. She will spend a night at the home of Barbara Henry  yes, Miss Henry  who moved back there immediately after her school year with Ruby. They were reunited 40 years later. Last week, several newspapers and Web sites ran simultaneous pictures of Sasha Obama's first day of school in Washington and of Ruby Bridges' first day at William Frantz. The connection  so long, tortured, serpentine, bloody, strained and, maybe, reconciled  needs so little explanation. Leona Tate, "Gliding past mobs, toward an education," The Times-Picayune, New Orleans, May 20, 2004, Metro, p. 7. The McDonogh Three; In 1960, three first-grade girls integrated McDonogh No. 19. After years of trying to forget the storm that swirled around them, today they are proud of their roles," The Times-Picayune, New Orleans, May 16, 2004, National, p. 19. From: Chris Rose, "Ruby Bridges' long walk; An icon of New Orleans integration will witness another milestone 50 years later," The Times-Picayune, New Orleans, January 19, 2009, National, p. 1. Chris Rose can be reached at chris.rose@timespicayune.com. Reprinted in accordance with the "fair use" provision of Title 17 U.S.C. § 107 for a non-profit educational purpose.